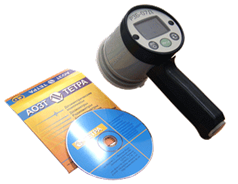 Radiometer RZB-07D „Tetra – B“ is designed to control the contamination of workroom surfaces with beta – active radionuclides, equipment and other objects by measurement of the flux density of beta – particles. Radiometer is used at nuclear fuel cycle facilities in the units responsible for controlling radiation situation. Level of the own radiometer background No more 3 part/ min ∙cm2. Operation mode setup time No more than 2 min. The displaycontains informationaboutduration ofmeasurement cycle,degreebatteries dischargeandmagnitudeof the statisticaluncertainty of the measurement result.